Enjoy relaxed dining in the 2 AA Rosette Caprice Restaurant near Reading, open daily from 06.30am – 22.00pm serving exceptional modern British cuisine and offering an extensive authentic Indian menu with exceptional Terrace for out-door al fresco dining or put your feet up, relax and spoil yourself with some Room Service. Flexible dining options including private and corporate banqueting available on request as well as Christmas Parties and Residential Packages / Offers. Looking for authentic gourmet dining in the Reading or Wokingham area? Look no further, our Caprice Restaurant boasts 2 AA Rosettes sat within our 4 Silver Star awarded Holiday Inn Reading easily accessed from the M4 Junction 10. We are beautifully placed alongside the River Loddon, you will love the views when crossing our footbridge into the establishment past our water features. Our distinguished gourmet restaurant and hotel are conveniently located within a minutes’ walk away from Winnersh Triangle Station which is the Reading to Waterloo train service taking you into London Paddington in just 20 minutes. Why not come grab a bite to eat whilst you await your train? Our delicious spread of taste bud tantalising breakfasts, lunches and dinners are available to enjoy at your leisure. Had a long day out at any of the following local resorts? Our restaurant’ near Legoland Windsor, Ascot Racecourse, Thames Valley, Windsor Castle or Thorpe park. Making it ideal to stop for a bite to eat when in the Reading Wokingham area. Dine in style with a high level of cuisine, in an ideal location just outside of Wokingham and Reading serving delicious and well priced fresh food are perfect for families, couples and business meetings. 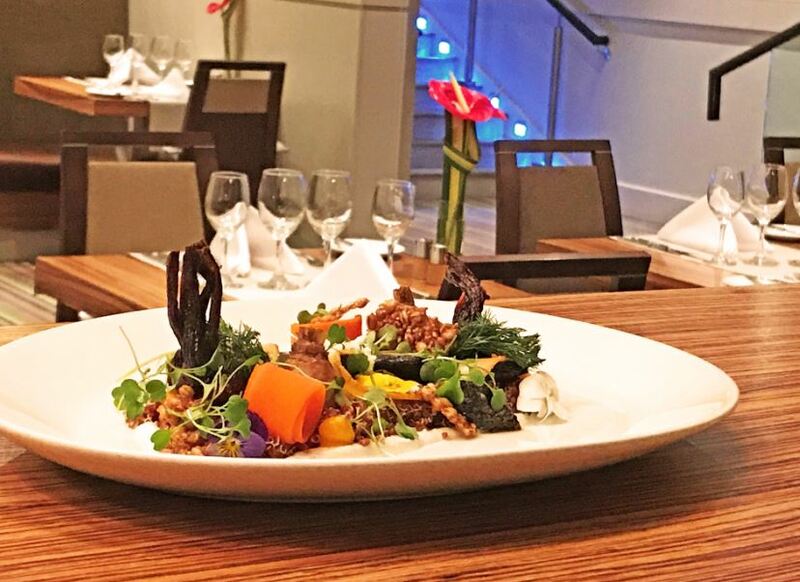 Our Caprice Restaurant is a stone’s throw away from the Showcase Cinema and would make the perfect date night, why not grab a bite to eat in our award winning reading Restaurant before catching a movie? To make a reservation at the 2 AA Rosette Caprice Restaurant please contact us directly on 0118 944 0444. Enjoy a delectable Sunday lunch in Reading at the our Caprice Restaurant, choose from our delicious three course menu offering the traditional Sunday roast or something slightly different. Our traditional Sunday lunch is served with seasonal vegetables, roast potatoes and gravy; everything you need for the perfect Sunday roast. All our dishes are prepared freshly on the premises so you can dine on exquisite food each time you visit the Caprice Restaurant. If you would like to book a table please get in touch or book online using the widget above. Our Caprice restaurant is located within our hotel; you can find the Holiday Inn Reading M4, Jct10 in Wokingham, just a short drive from Reading. If you're visiting Reading or Wokingham our restaurant is the perfect location to stop relax and have a bite to eat, we have plenty on offer for everyone to enjoy. Situated right next to a train station makes it even easier to visit our restaurant in Wokingham. Read more about our great location or get directions to find us.